The poor zucchini plants lost it's battle with the scorching heat and lack of rain. 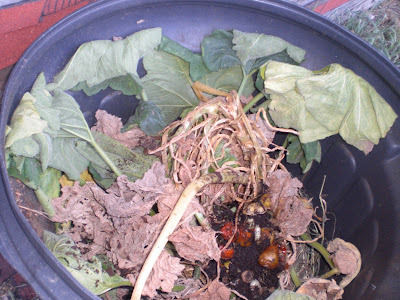 We pulled 2 plants today and tossed them into the composter. I was actually pretty sad, really sad to have to pull these plants, since there were little baby zucchinis growing on it. I was hoping the plants would pull through, and was hoping for more zucchini this year. I didn't quite get the overload of zucchini that I was wishing for. But the poor thing was so wilted and the leaves had turned brown, and the vine snapped off the roots. We still have 2 more plants in the ground, but they look like they are also knocking on death's door. Ugh! See you next year my dear summer squash! In prior years we have had yellow squash and zucchini coming out our ears with just one plant. This year, the fruit fails prior to maturity. All I can say is 'strange gardening year'. Go figure. We'll just eat green beans instead. ;) Enjoy your weekend. Sorry to hear about your zucchini loss. Ours are slow to produce this year. We have 8 plants as opposed to the three last year and last years harvest was greater. Sorry to hear you lost your zuke plants. On the other hand you won't be growing monsters or having to leave bags of zukes at an unsuspecting neighbors door! Yeah, I don't know what it is about the squash/zuchinni that makes their stems wilt up and die, then causes the rest of the plant to die. Sorry. Death day for the garden squash. And the irony is that you would have gladly taken more squash! Put a sign out in the front yard "squash wanted" - you may find quite a heap, lol. Poor zukes. But on the positive side, you've used them in your compost bin! Okay, not exactly something to cheer about. Sorry. Ouch... too hot for squash! My are still begging for some sun, I wonder if tomatoes and peppers will even happen this year! Thanks for visiting... Stay Cool!! I plant a couple more zucchini on July 1st. Sorry about that. I know how you feel. I also had high hopes for Zucchini Bread by the loads but to my horror the weather also got me. Oh well there's always next year. We love to hear from you. Thanks for leaving a comment! Novice urban gardener & beekeeper documenting my adventures in gardening in NYC. I garden by trial & error. My goal is to grow my own organic food, recycle & conserve. I would love to do a seed exchange or plant exchange with other New Yorkers. Contact me if you are interested. Tomatoes, two kinds + one spicy pepper! Dahlia the size of a human's head? My First Bell and 100th Post Giveaway! I wanna be chopping broccoli! More things to look forward to next year. Finally a bug repellent that works! When will I get some lemons? What to make with tomatoes and basil? The good and the bad! Oh Compost, I can't wait to use you! Burpee, you redeemed yourself yet again, Part 2. The best $7.50 I ever spent! Looking for the story of my nuc bees that swarmed? Join the Chinese Kitchen Garden Community! Installed a NAS for the holidays. When It Gets Hot, Help The Bees.